On the next day, the second weekday, everything that is customary is done from the first cockcrow until morning in the Anastasis;* also at the third and sixth hours everything is done that is customary throughout the whole of Lent. But at the ninth hour all assemble in the great church, that is the Martyrium,** where hymns and antiphons are said continuously until the first hour of the night and lessons suitable to the day and the place are read, interspersed always with prayers. Vespers takes place when its hour approaches, that is, so that it is already night when the dismissal at the Martyrium is made. When the dismissal has been made, the bishop is escorted thence with hymns to the Anastasis, where, when he has entered, one hymn is said, followed by a prayer; the catechumens and then the faithful are blessed, and the dismissal is made. On the third weekday everything is done as on the second, with this one thing added--that late at night, after the dismissal of the Martyrium, and after the going to the Anastasis and after the dismissal there, all proceed at that hour by night to the church, which is on the Mount of Olives. And when they have arrived at that church, the bishop enters the cave where the Lord was wont to teach His disciples, and after receiving the book of the Gospel, he stands and himself reads the words of the Lord which are written in the Gospel according to Matthew, where He says: "Take heed that no man deceive you." And the bishop reads through the whole of that discourse, and when he has read it, prayer is made, the catechumens and the faithful are blessed, the dismissal is made, and every one returns from the mount to his house, it being already very late at night. On the fourth weekday everything is done as on the second and third weekdays throughout the whole day from the first cockcrow onwards, but after the dismissal has taken place at the Martyrium by night, and the bishop has been escorted with hymns to the Anastasis, he at once enters the cave which is in the Anastasis, and stands within the rails; but the priest stands before the rails and receives the Gospel, and reads the passage where Judas Iscariot went to the Jews and stated what they should give him that he should betray the Lord. And when the passage has been read, there is such a moaning and groaning of all the people that no one can help being moved to tears at that hour. Afterwards prayer follows, then the blessing, first of the catechumens, and then of the faithful, and the dismissal is made. * The Anastasis is the Rotunda in the Church of the Holy Sepulchre, where the tomb of Christ is located. 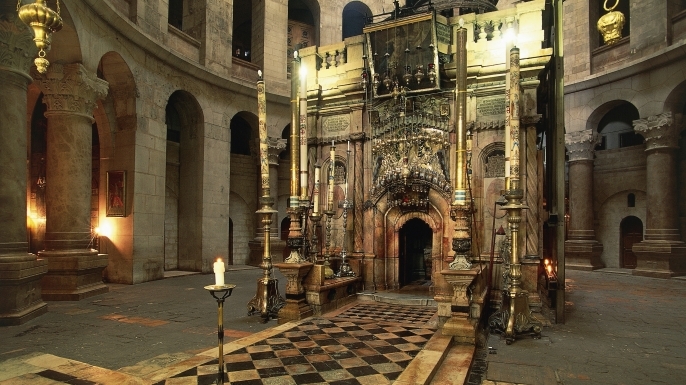 ** The Martyrium is the main church within the Church of the Holy Sepulchre.